Anna, an eclectic painter, painted professionally from 2005 to 2016. She studied with Sonia Carpenet, then with Valentina Valente, and finally with Dino Bartolomeo, together with Tony Caforio and Mario Magnatti. 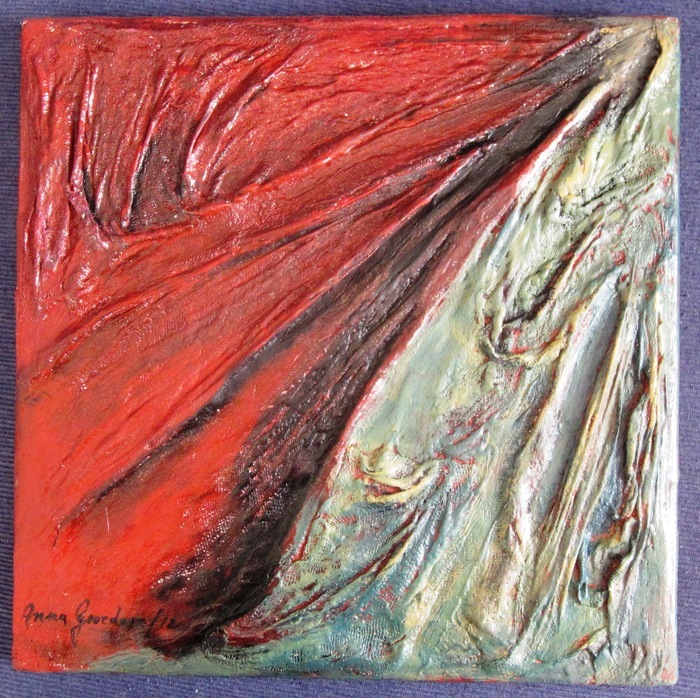 She normally used acrylic colours, on canvas, wood or mason wood, but sometimes also mixed media (inclusion of paper, pumice or gauze integrated with the acrylic paint). MAMAG Modern Art Museum, Blindenmarkt Austria, permanent collection (1 painting from 2016). •	Group exhibition, Gallery Steiner, Vienna, February-March (10 paintings); canceled due to the death of the Artist. 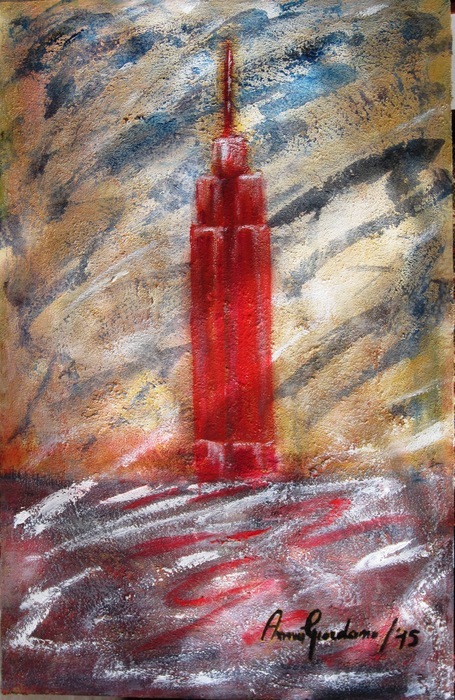 •	“Mostra d’arte di Natale”, (Christmas Art Exhibition), Galleria La Telaccia, Torino, November - December (8 paintings). 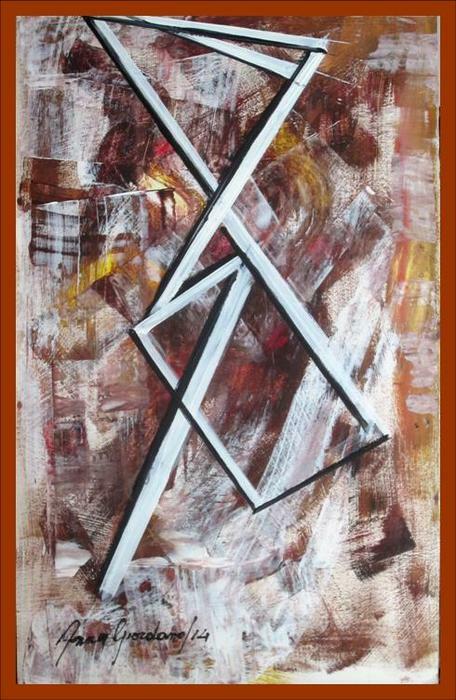 •	Solo exhib “Il vissuto dell’esperienza” (The lived experience), Galleria Arte Maffei, Padova, October (28 paintings). •	“Astratto e informale contemporaneo” (Contemporary Abstract and Informal”), Galleria Arttime, Udine, September (4 paintings). 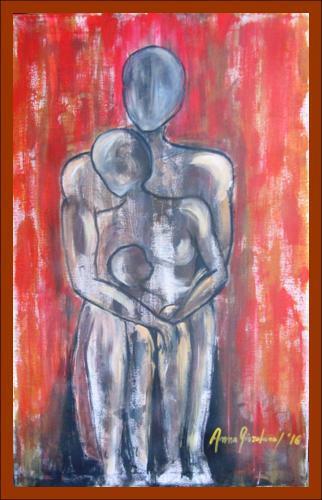 •	Art contest “PonzArt..arte d’aMare” (PonzArt..Art to love), Museo dei Confinati, Isle of Ponza, luglio, (1 painting). •	“Donne in rinascita 2016”, (Women in revival), Galleria PassepARTout c/o Atahotel Expo Fiera Pero - Milano, March (1 painting). 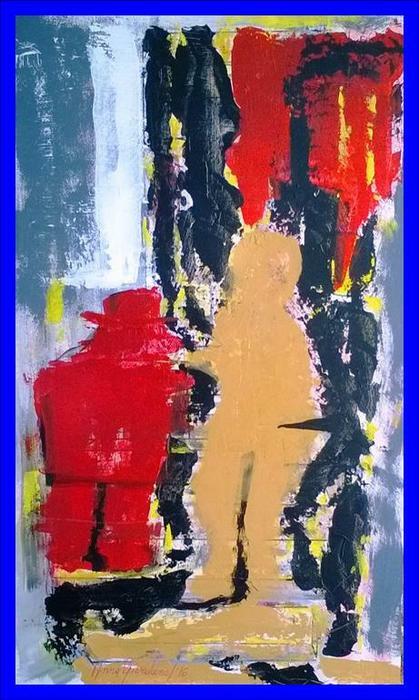 •	“Central Europe Fine Art Biennale 2016” MAMAG Modern Art Museum, Blindenmarkt Austria, January - March (1 painting). 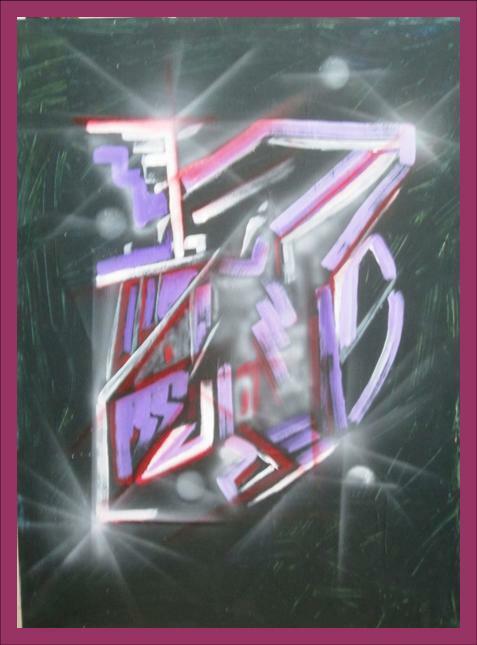 •	“Fine Art Masters Pieces”, MAMAG Modern Art Museum, Blindenmarkt Austria, December 15 - January (1 painting). •	“Christmas Exhibition II ed.”, Galleria Wikiarte, Bologna, December 15 - January (2 paintings). •	“Riflessi d’Autore” (Author’s Reflexes), Galleria Centro Storico, Firenze, December (1 painting). 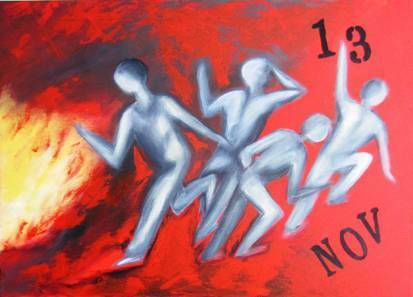 •	“Artisti per il Giubileo” (Artists for the Jubilee), Galleria La Pigna, Roma, December (1 painting). •	“Salon Art Shopping 17^ ed.”, Carrousel du Louvre, Paris, October (1 painting). 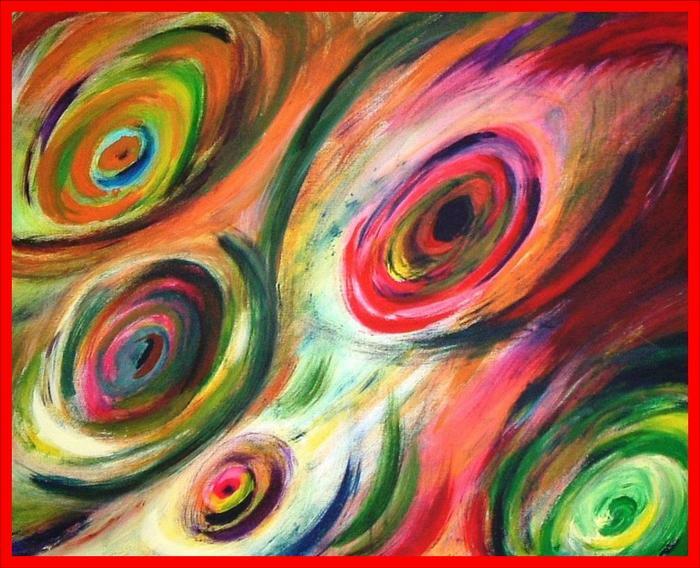 •	“Arte e colore” (Art and colour), Galleria Arttime, Udine, August, (4 paintings). •	XXXIX “Premio nazionale Minturnae”, (National contest Minturnae) Centro Studi Minturnae, Minturno LT, August (1 painting, finalist). 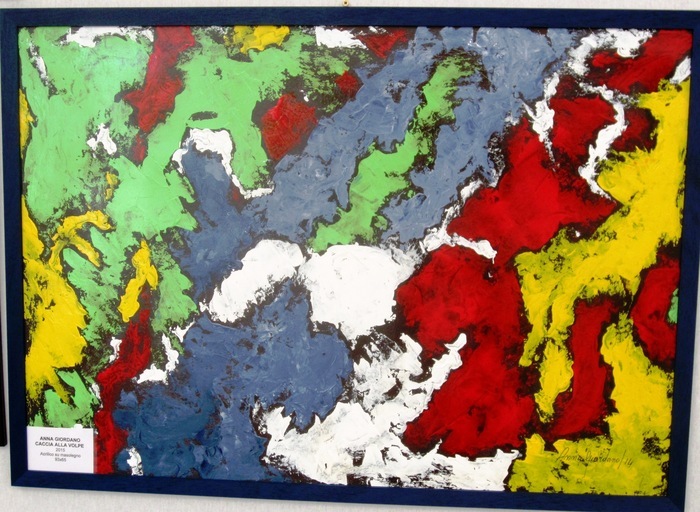 •	“Arte astratta e informale” (Informal and abstract Art), Galleria Arttime, Udine, July, (4 paintings). •	Modern and Contemporary Art Fair “ArtMonaco’ 15”, Espace Fontvieille, Montecarlo, July, (15 paintings). 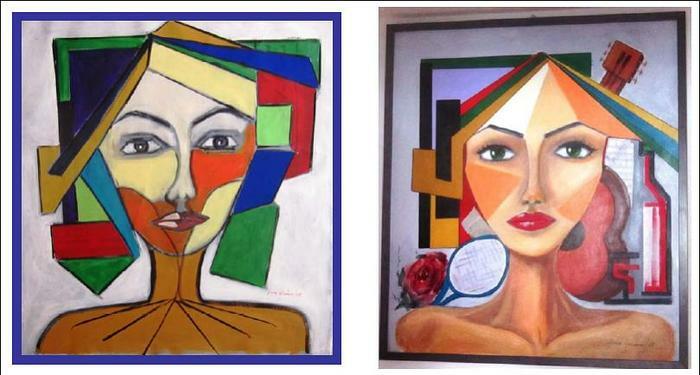 •	"Modern Art Wonder", MAMAG Modern Art Museum, Blindenmarkt Austria, May-June, (2 paintings). •	“Rappresentazione del mondo attraverso l’Arte” (World representation through the Art), Pinacoteca d’arte moderna Le Porte, Napoli, May-June, (1 painting). •	“Nella storia, da Caravaggio ai nostri giorni” (In history, from Caravaggio to our days), Bramante rooms, Roma, May, (1 painting). 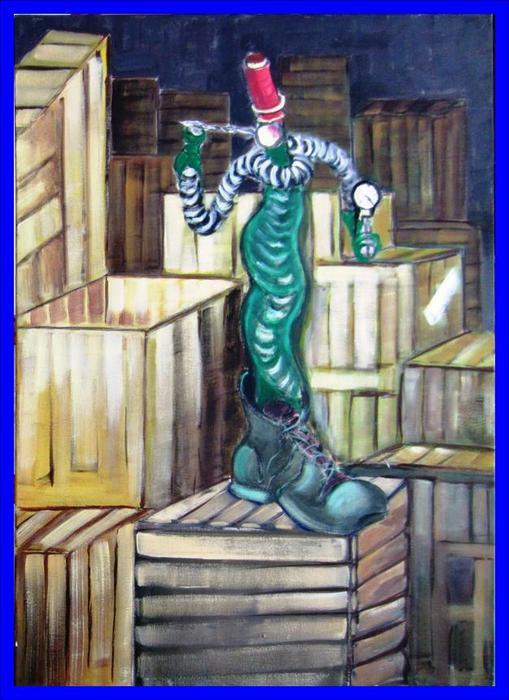 •	"The magic World of ART", PAKS Gallery, Blindenmarkt Austria, April-May, (2 paintings). 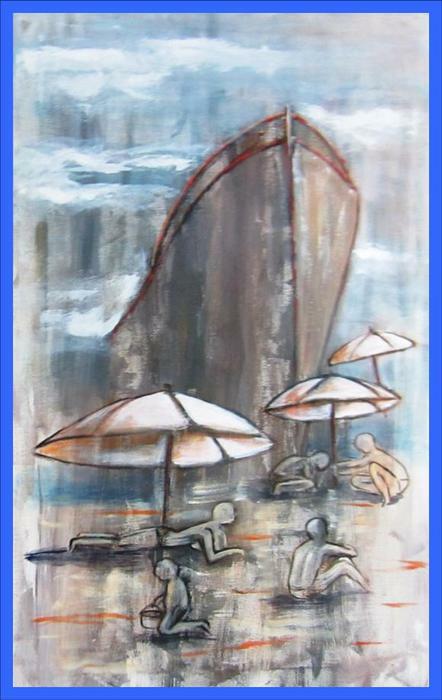 •	“Il mare dentro” (The sea inside), Museo Diocesano di Gaeta LT, April-May, (5 paintings). •	“L’arte fra tradizione e innovazione” (The art between tradition and innovation), Pinacoteca d’arte moderna Le Porte, Napoli, February-March, (1 painting). •	2nd Biennale di Palermo (2nd International Art Biennial of Palermo), Albergo delle Povere, January, (2 paintings). 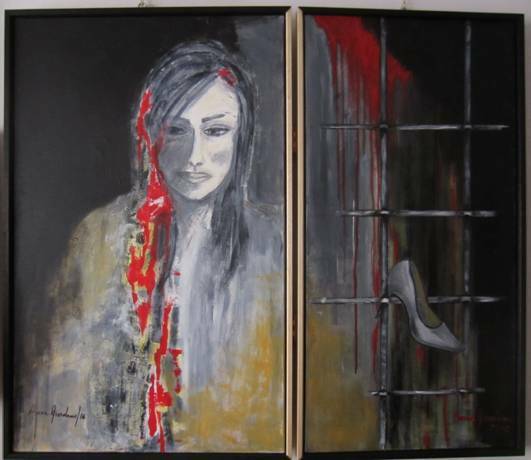 •	Art contest “GaetArt_Arte in libertà”(GaetArt_Art in freedom), Museo Diocesano di Gaeta LT, October, (1 painting). •	“Arteando” (Making Art), Museo Diocesano di Gaeta LT, July (12 paintings). •	Itinerant exhibition “Terra dei Fuochi” (Fires Territory), Belvedere di S. Leucio CE, May-June, Museo Diocesano di Gaeta LT, October-November, (1 painting). 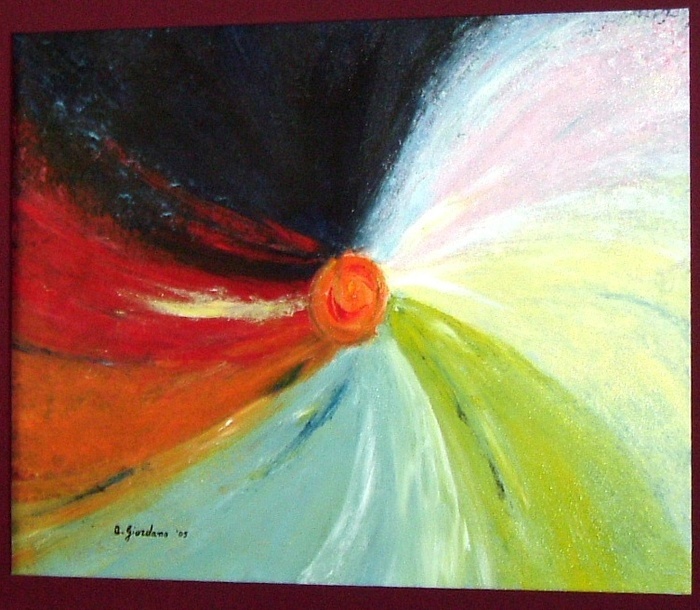 •	“Festa della donna” (Women’s day), Flacca Caffé d’Arte, Gaeta LT, March, (1 painting). •	“Publisher Choice Award”, (2017: two times), with an article published in the magazine “Art & Beyond”: one page - and photo of one painting - March/April; two pages - and photos of two paintings - January/February. •	Finalist of “20th Online Artavita Contest”, September 2016. •	“Publisher Choice Award”, (2016: six times), with an article published in the magazine “Art & Beyond”: one page - and photo of one painting - November/December, September/October, July/August, May/June, March/April; two page - and photos of two paintings - January/February. •	“Artista dell’anno II ed.” (Artist of the year), Firenze, December 2015. •	“1° Grand Prix de la Côte d’Azur”, Cannes, April 2015. •	Text “in memoriam” of Mila Ryk, published in the site gallery and in N. 44 of the magazine “Art & Beyond”, march 2017 (original). On January 24, 2017 the art community lost a wonderful human being, friend and artist, Anna Maria Giordano. Anna passed on after a very long and brave battle with Lymphoma. She was and still is a dear friend and member of Art & Beyond Publications and her artwork will continue to grace the pages of our Online Magazine. It has been a great pleasure to have had the opportunity to publish her latest work entered right before her unfortunate and untimely passing. The Art World has lost a wonderful artist but her spirit lives on through her work which we will continue to enjoy for many years to come. •	Text of Monia Malinpensa, published in the flyer of “Mostra d’arte di Natale” (Christmas Art Exhibition), October 2016. (8 paintings) (original in Italian). 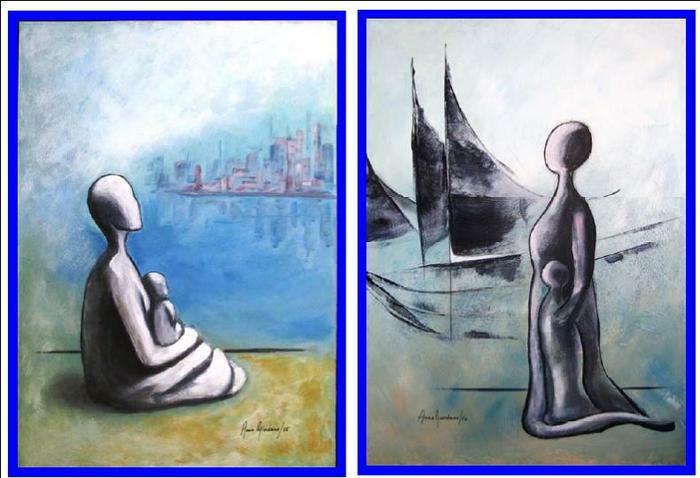 The artist Anna Maria Giordano shows, through a deep expressiveness, that can translate any descriptive element in true emotion, a pictorial discourse important and very personal. She, with a research that goes from figurative to abstract, shows an evolution of concrete outcome. Memories, fantasies, moments, dreams and feelings live in the artwork in a context of symbolic and chromatic gestures of original creative effect. The volumetric system, of impressive implementation, and the construction of the surface, of remarkable structure, give us a very modern vision of shape and concept, with evident chiaroscuro qualities. 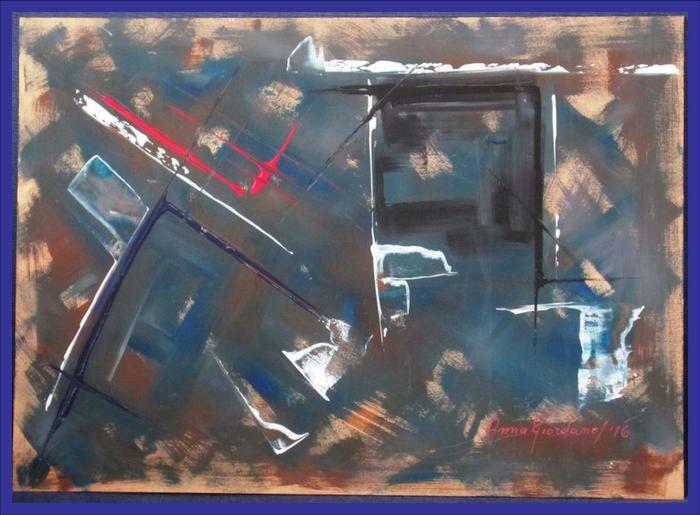 In a surreal atmosphere, always respectful towards humanity, the artist Giordano describes a painting dense of meanings and of poetic consistency. The wider and firm brushwork, the definite and dominant color and the clear and concise tract result in an interpretative incisiveness continually explored. The value of the human figure is for the artist widely expressed within the artwork and outlines a particular sensitivity. 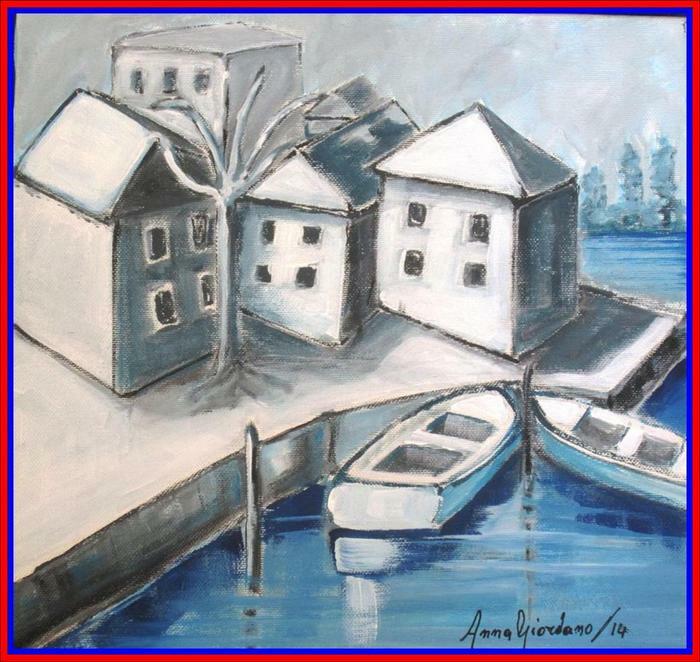 It is a painting, that of Anna Giordano, conceived with passion and spiritual wealth always imbued with values, where one breathes the love for neighbor to whom it conveys a message of hope and peace. •	Text of Manlio Gaddi, published as introduction in the official catalog of the solo exhib “Il vissuto dell’esperienza” (The lived experience), September 2016. (28 paintings) (original in Italian, digest). You can see in the varied artworks by Anna Maria Giordano the research into an ultimate end of painting: to transform every kind of experience, from the dream to the everyday life, from the microscope to the stars vision, from realism to abstraction, in a continual pursuit of quality and in the foundation of a new expressive language. Her works are often complemented with traditional figurative signs, ideographic writing, graffiti, geometric shapes: these are some of the codes used and transformed by Anna Giordano, who devotes a special focus to the internal dynamics of the image. Each work reveals an accomplished harmony, and one senses the preparatory part, such as the choice of the medium, on which she will impress pigments, sometimes so earthy to recall certain Rembrandt, securing the light to be turned into life energy; or as a hardworking choice between dozens of drawings and/or anyway images, to retrace a spiritual path of classical architecture. The result is a pattern of the image with a central perspective into deep space projecting plans, through the firm path of diagonal lines, re-edited the “divina proportione” of the golden section of the Grand Masters. You understand a follow-up, marked through time, as a moment of pure reflection: a formal control of the balance between space, light and image through the scrupulous examination of the ended work at the mirror, subject to the introspective "labor limae". Real root of rigor and memory, that, enhancing severity and discipline, even more vivifies the sight of the harmony of these works. 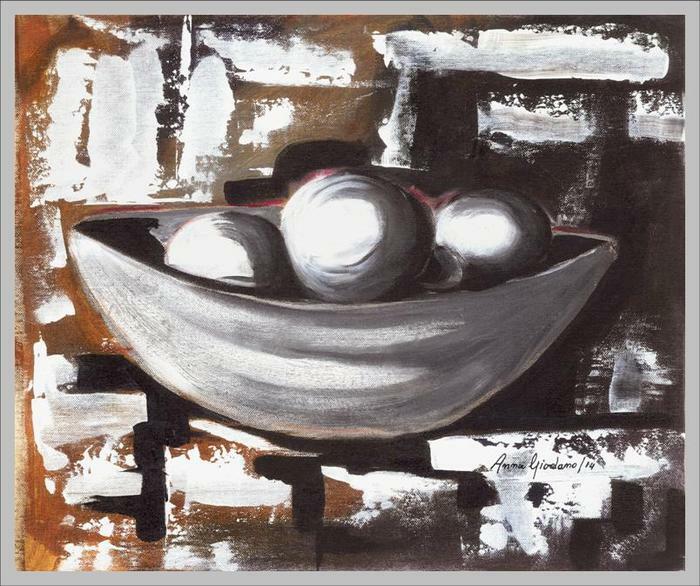 It is easy to refer to modern Masters such as Morandi, but also Braque, Gries and Balthus, recalled in particular by the guitar that plugs into most paintings among the ingredients of the still life and becomes a dominant form in the picture, even if inserted into the background, giving its own rhythm to the whole composition with its accentuated perspective deformation. The works of Anna Giordano deliver the legacy of the past to the evocative power of the present. In the inner light it is hidden the diaphanous soul of anonymous unrealized faces, hands, attitudes, suspended in an undefined dimension. 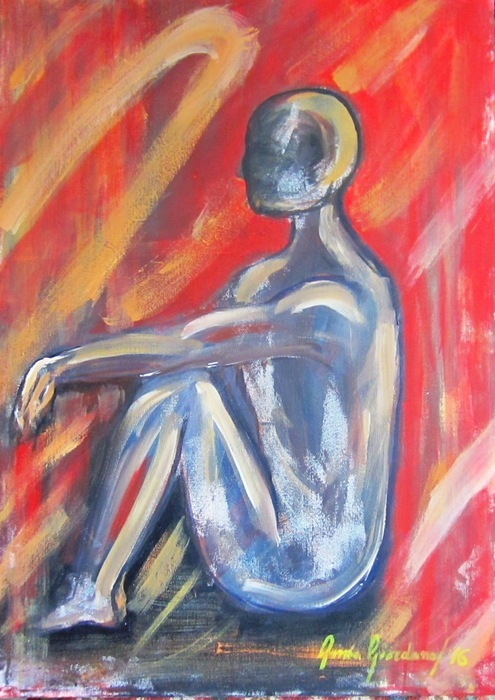 Intense brushstrokes, the result of chromatic passages thinning down, but equally sweet and tireless, they own the space: the incommensurable, between the real and the metaphysical, which the peaceful introspective proceeding by the artist gives to painting of timeless high poetic value, between evocative spirituality and thematic inspiration. The human figure is a fil rouge that links a large number of her works: it strikes the absence of facial features, the bodies can be either caught by the back or amorphous figures, or ectoplasms, or transfigured or reduced to little more than thick white and green lines. Anna Giordano shows us the reality of the unreal: everything is illusion. Even life. In the metaphysical interior, the grey anticipates a description in perspective foreshortenings, where the cone-shaped shadow leads the brightness of the whole. Small shelves bi-tripartite, niches of a space no space, welcome the rigorous "cubist" scenic alternation: spheres, pyramids, set squares, easels, rulers and calipers. Dumb symbols that recall the esoteric unconscious emotional power, accepting, like meteors in the space, notes of maybe lived experiences. The artist often leaves it to landscape her own existential reason, the reflex of her own destiny. Into a free but still self limited expression of that color, of that vivifying note, that, while fastening on the memory, acts as a mirror of the twinkling subjectivity and shows the connection between reason and feeling. The experience of a landscape, of a place, of an atmosphere of lights and natural colors: Anna Giordano tries to extract the essential elements from those feelings, in order to transform the spatiality of the environment, of the houses, of the cities views, in the autonomous architecture of the picture. So she transposes the shapes and colors of an object observed by the true in the two-dimensionality of the painted surface, following a pattern of monochrome backgrounds, mostly trapezoidal. On a sort of instinctive expressionism, supplemented by cubist and futurist depictions, Anna Giordano elaborates an image basic structure of high dynamism and immediate visual impact, deliberately without excessive erudite references. 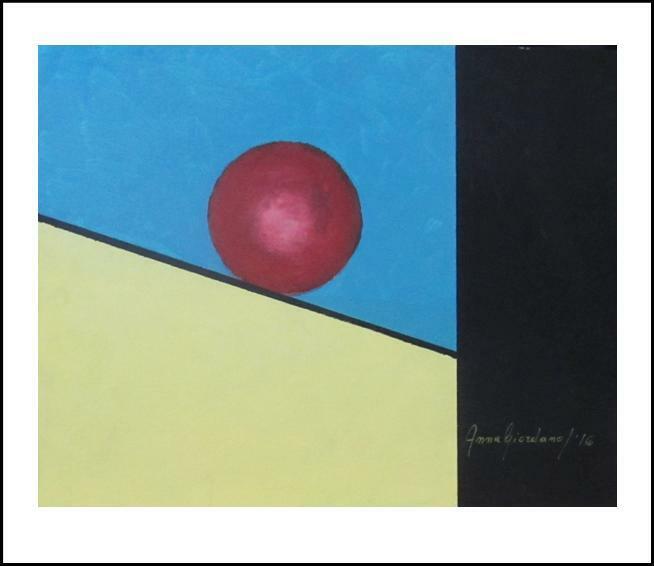 From it, the artist moves his tries in an abstract area, in the surrealist and dadaist field with certain unpredictable and playful combinations of shapes and heterogeneous materials. In some works, where the features are recognizable, the regular brushstrokes structured of predominantly rectangular and variously oriented tiles, suggests the construction of self-sufficient plastic forms, whose volume is independent of the object represented. Altogether in her works one can recognize that substantial component of eclecticism that is the basis of the production of Anna Giordano images. A component that, paradoxically, we could consider as homogenizing all her activity. From the dialectic between conscious and unconscious, the artist opens the assumption of other forms, other languages, with the specific and primary purpose of giving life to an imagerie functional to the desired end product. Our Committee salutes you on your oeuvre with its important visual narrative and its emotional link to the human and artistic experience. We are so pleased with your marvelous art and the positive energy of your stellar compositions. Our noteworthy Curatorial Review Committee was most impressed by your superb oeuvre such as "Education Job" which resonates with a profound visual narrative as you reveal the invisible within the visible. The spiritual artistic journey that you portray in your stellar oeuvre was quite impressive and was a triumph of personal expression. 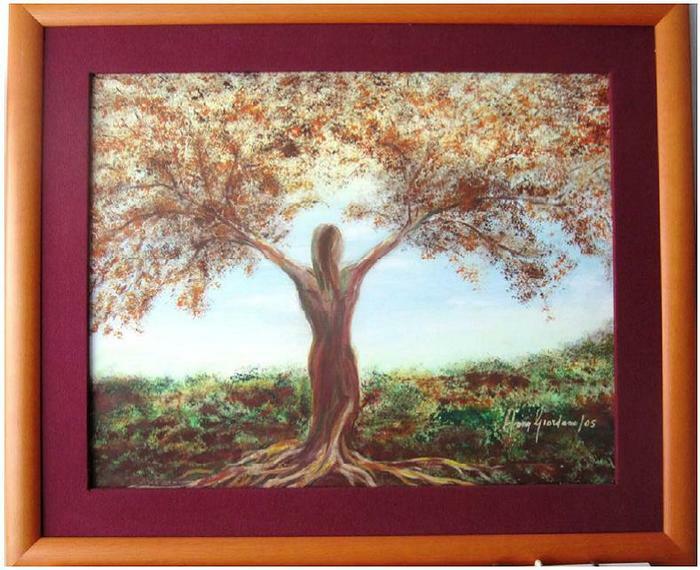 "May" generated a profound sense of symbolism while reflecting a universal message. We salute you on your aesthetically absorbing oeuvre which reverberates with a dynamic textural sense and powerful visceral shapes. 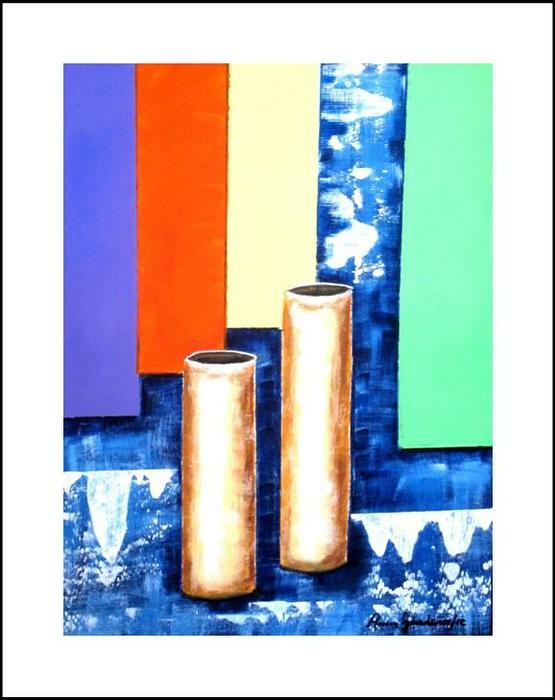 We were enthralled by the emotive quality ''Bottles 6" which reflects your fine talent and vibrant visual intensity of colors, as well as your lyrical use of Light. 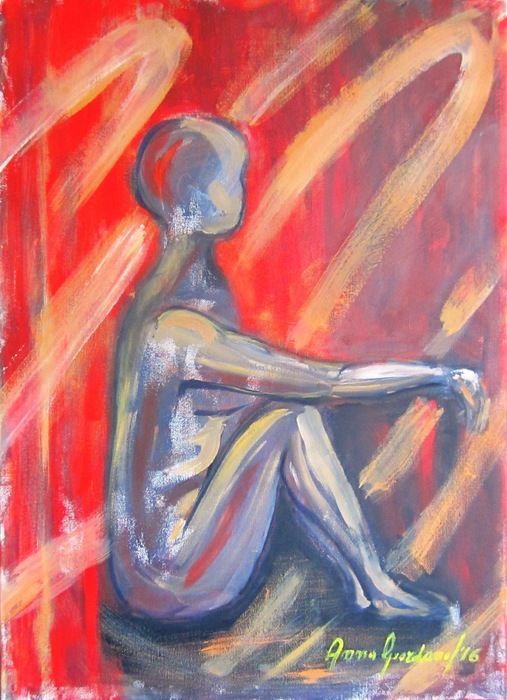 Your compelling "Modern Woman" conveys your unique artistic vision of capturing the impalpable as you seize the essence of the emotional and physical experience. 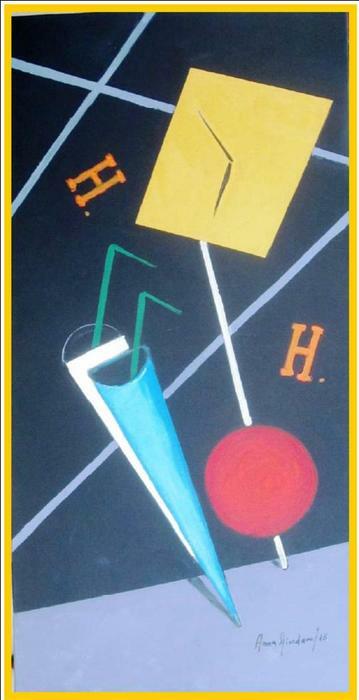 •	Text of Salvatore Russo, with photo of one of her paintings, published in the art book “The best Modern and Contemporary Artists”, November 2015. (original). 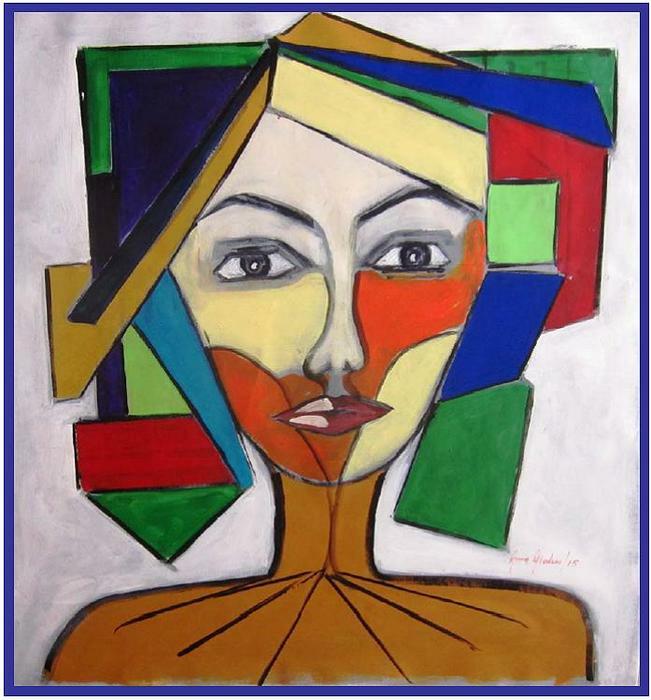 “Modern Woman” is a work that binds the figuration to the geometry of the sign. In this work, Anna Maria Giordano, tells us about a woman and her thoughts: thoughts related to the music world. 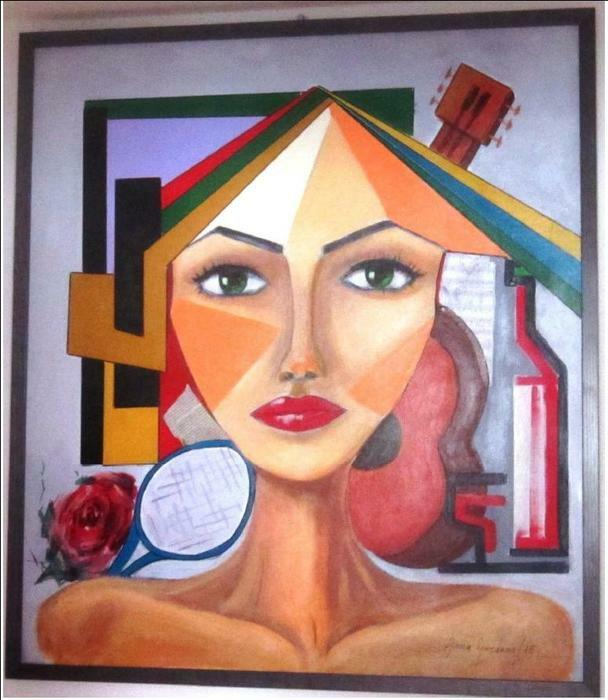 As a frame to the woman’s face, make the guitar and the musical score. The artist paints, therefore, its beautiful melodies on canvas. 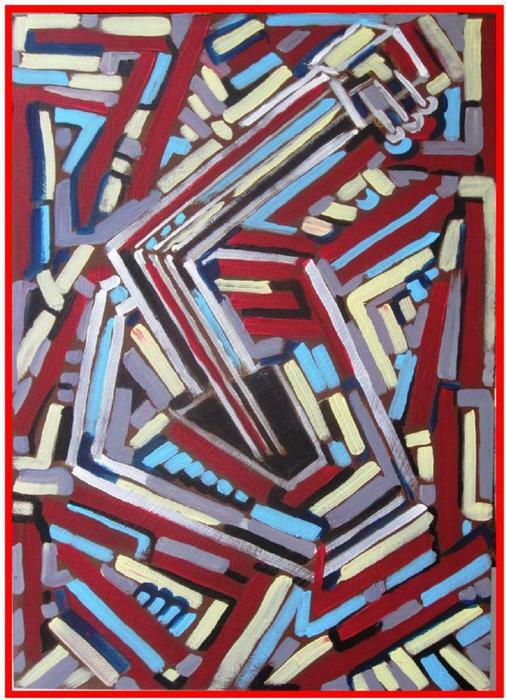 Anna Maria Giordano interprets his art with tangles of lines and colours that blend in abstract geometries. 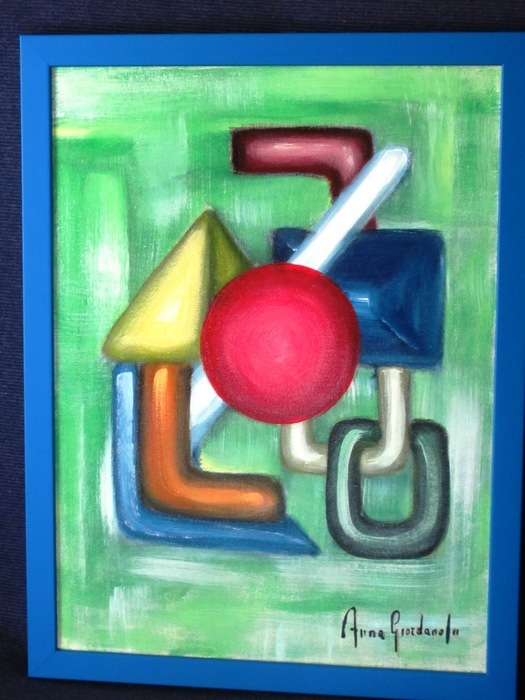 A series of works in which games of signs and geometric shapes are interlinked in an abstract fusion. 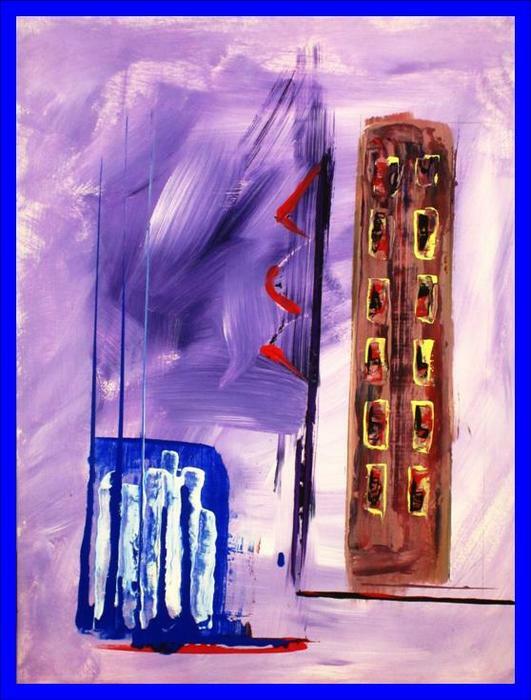 The observer should not, and can not, ignore the executive path of this painter of remarkable talent. 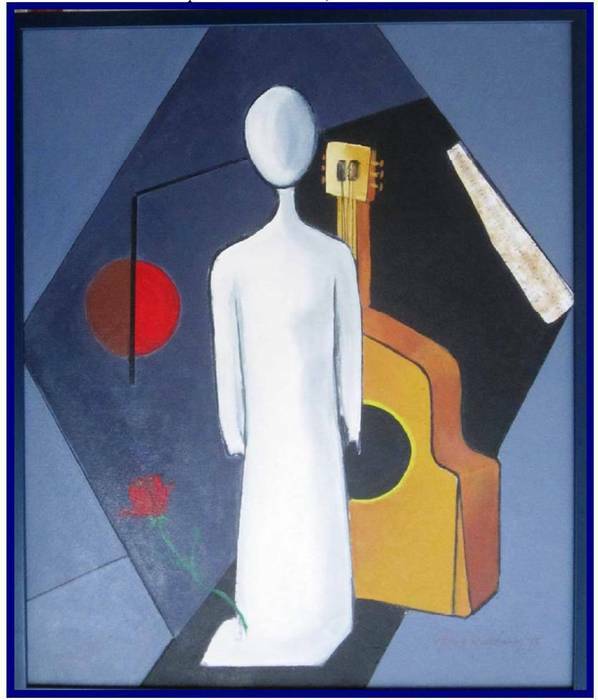 As the musical composer lives and express himself through the notes, so this virtuoso artist communicates through the colour and significant signs. 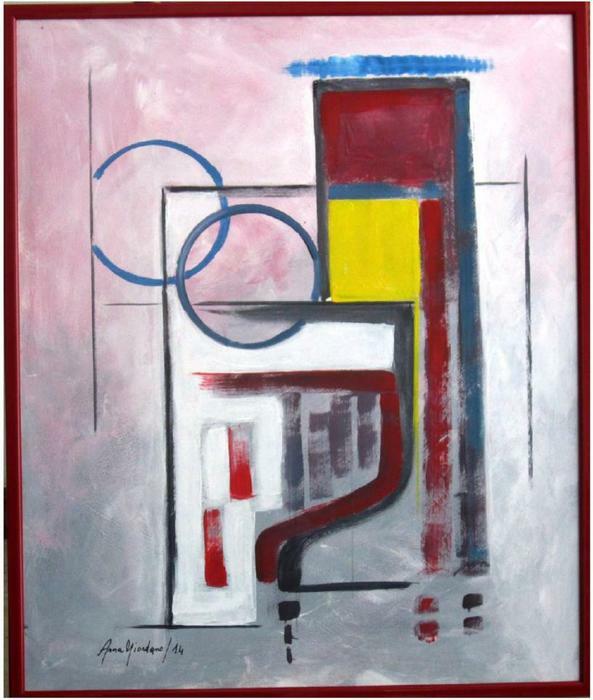 From what we can see, its tendency is to proceed from the figurative to an informal post cubist with bright colours. 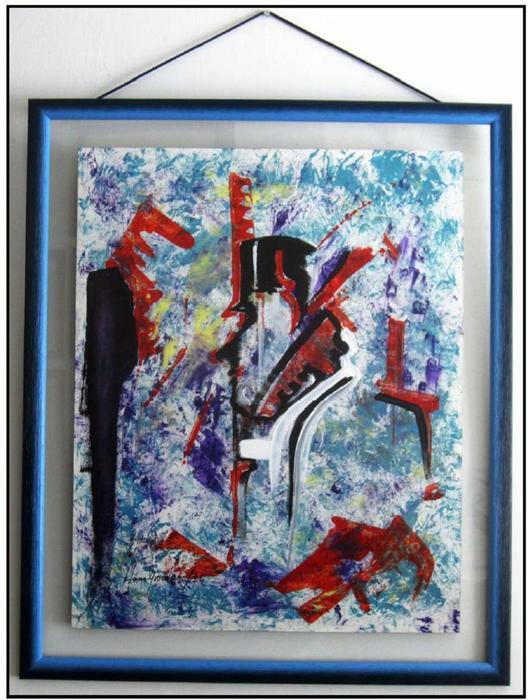 •	Text of Salvatore Russo, with photo of one of her paintings, published in the art book "Eccellenze” (Excellences), 2015. (“Fox Hunting”) (original in Italian). 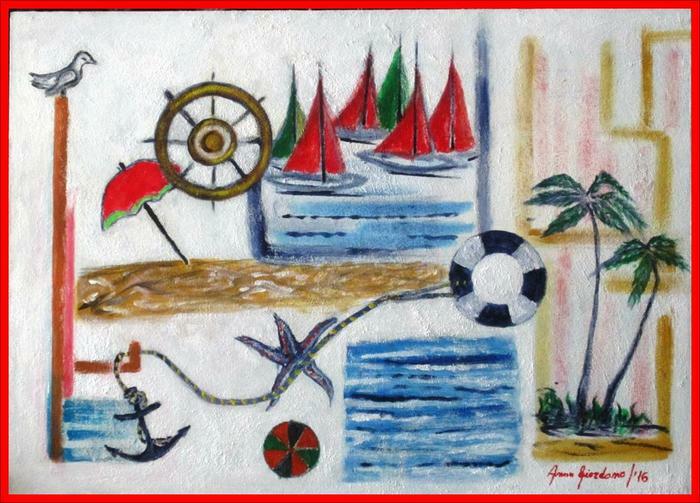 The mix of different elements has always characterized the art making by the artist Anna Maria Giordano. This happens through the use of stylizations and colours that reveal her great talent and boundless creativity. An Art where perceptive plans and emotional tones are overlapping, peculiar interpreter of a soul that is engaged in the relentless pursuit of new representative horizons. Undoubtedly Anna Maria Giordano meets the taste and imagination of the viewer, of whom she attracts the attention suggesting herself as a big and valid interpreter. •	Text of Sandro Serradifalco, with photo of one of her paintings, published in the art book "Eccellenze” (Excellences), 2015. (original in Italian). 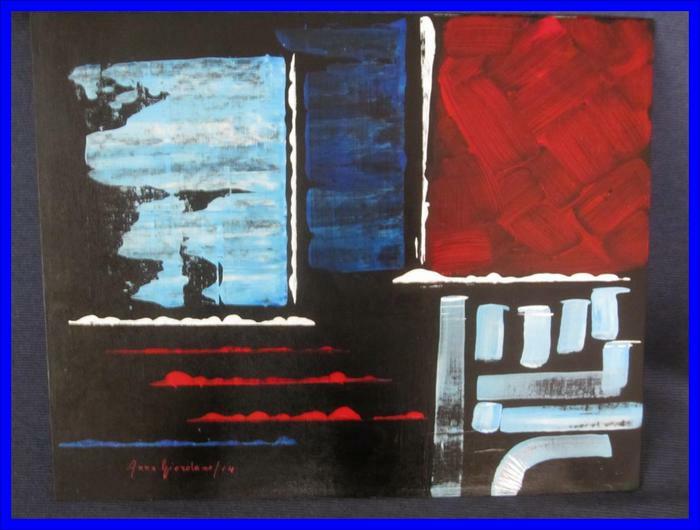 The love of the surreal and the abstract invested the creativity of the artist Anna Maria Giordano that makes use of symbols generally accepted in order to make the viewer better discern the description of the pictorial contents. This goes also with vivid colours that emphasize masterfully the pictorial lines. A Modern Woman with her complexities and fragilities is the protagonist of the pictorial composition of Anna Maria Giordano. The painter, master of sonic and colours, is supported by his talent, impetuous interpreter of his sensitive soul. 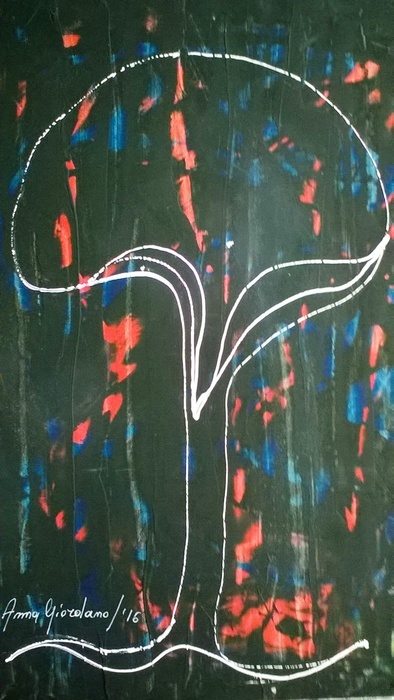 •	Text of Stefania Bison, with photo of one of her paintings, published in the art book "Eccellenze” (Excellences), 2015. (“Tasting”) (original in Italian). It is a sophisticated expressive research, where the colour is the only true star of the poetry of this talented painter. The sign is not even an implicit suggestion. Her forms are abstract, lyrical informal, vibrant in their infinite immanent shades. 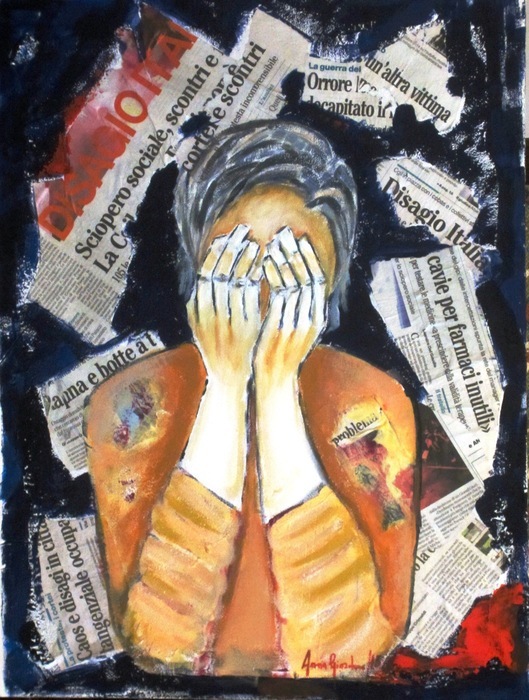 The works by Italian artist Anna Maria Giordano hit with their emotional language. The magical and poetic light reaction in the artworks of Anna Maria Giordano carries the viewer into the world of emotional language. 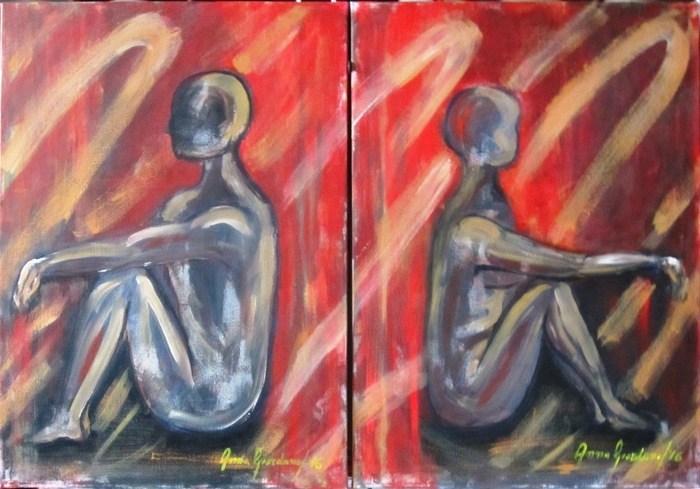 The artist communicates through her images on an emotional level and allows the viewer to feel the world of feelings. The proximity, security and protection feelings are an important issue in her work. 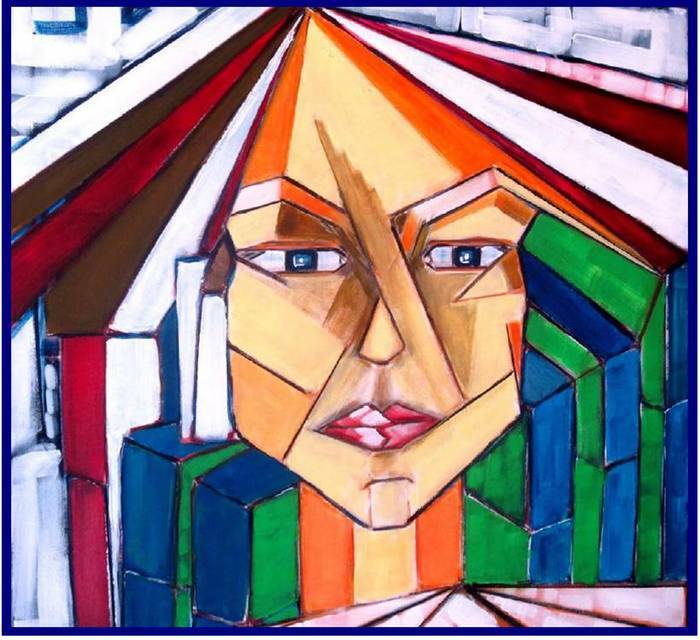 Sometimes she used elements of Cubism with color contrasts in her own style and comes with the viewer in a dialogue. •	Text of Jean Charles Spina, in conjunction with the awarding of the “1° Grand Prix de la Côte d’Azur”, Cannes Palace Hotel, April 2015. (“Cabaret”) (original in Italian). A great skill in transfiguring the abstract, with very good versatility and astonishment aimed at the research of an emotive project. The artist creates her characterized and symbolic intuitive projections, by superimposing signs and symbols of rich material drawing up. •	Text of Josè Van Roy Dalì, with photo of one of her paintings, in the Section "Artista nella Storia" (Artist in History), published in n. 1/2015 and n. 2/2015 of the magazine “Effetto Arte”, and, with photo of another of her paintings, in the art book "Artista nella Storia", February 2015. (“Maturity”, “Waiting”) (original in Italian). 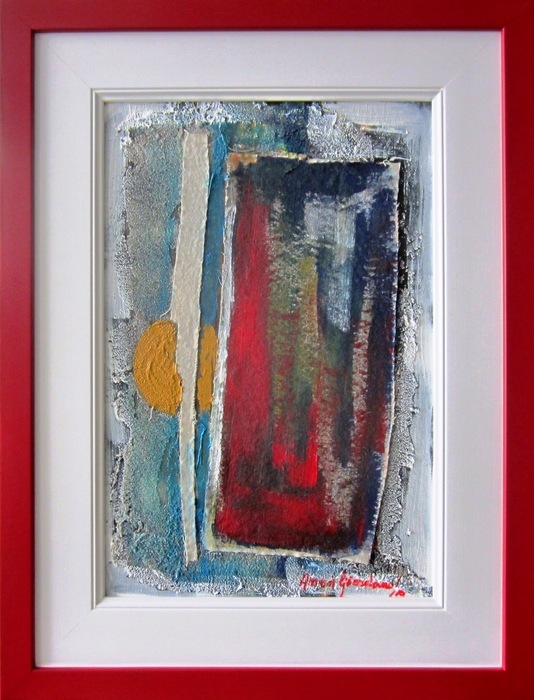 The artworks of the Artist Giordano distinguish themselves by the intimacy concealed behind the represented subjects. The artist has succeeded, through a careful and creative research, in creating a personal style and her own visual language, from which express the deeper emotions. So she shows us the complexity of the world and sentiments, originating compositions that have great communicative value. Ms. Giordano has succeeded in going beyond simple aesthetic representation, her artworks investigate new realities through a chromatic language, that underlines the unspoken values of the sign and a pictures dialectic full of poetical emotions. Sometimes her painting becomes mystery, assumes a charge of deep meanings and leaves to the fruition the freedom of interpreting it, by posing questions, from which new reflection points are obtained. Therefore, art as pure manifestations of emotions that spring from every object, event or situation and give to a person, through elegant and fine compositions, a new perception of reality. What a disappointment, at first view, was the Exhibition Palermo Artexpo, included in the 2nd Biennale Internazionale d’Arte di Palermo. But, fortunately I went also to the Albergo delle Povere, one of the four sites in which the exhibition was divided, where I could at last admire something with an inside idea. In the rich bundle of really appreciable artworks, it seemed to me that Anna Maria Giordano’s canvas was worth of attention, as she insinuates the idea of a “Feminism” becoming Church. Always looking for a balance between the flow of inspiration and the contemplation of the content, it is now no more enough for me to simply produce artworks in which, through a visible recognizable, also it is possible to describe the intangible, invisible, behind people and things, but I need that my works, poetical from my point of view, " narrate "something. And maybe put side by side they would narrate something extra because of the approach, leaving even room to the imagination of the viewer. 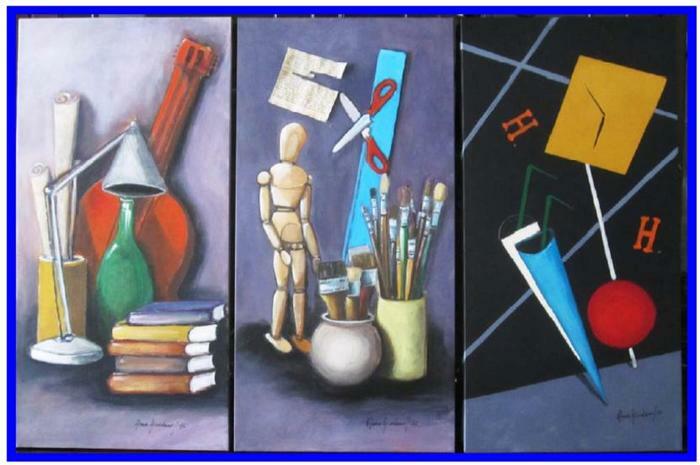 And it looks explicit to put side by side the objects that are represented in the 3 paintings “EDUCATION”, “JOB”, “HAPPY HOUR”. 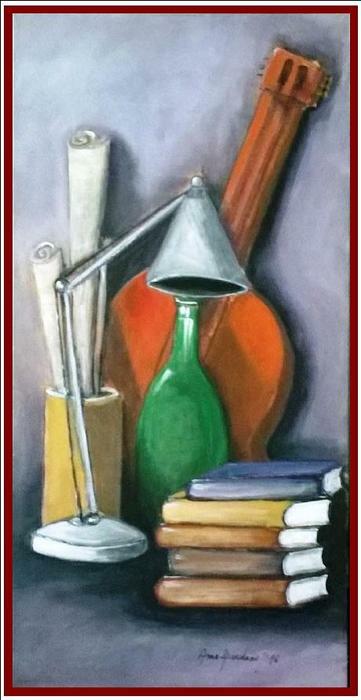 In "EDUCATION" you see some of the objects with which one prepares for life, there are books, a guitar, rolls of drawings, a lamp, a bottle; one senses that the preparation is socio-cultural, not only cultural or professional. 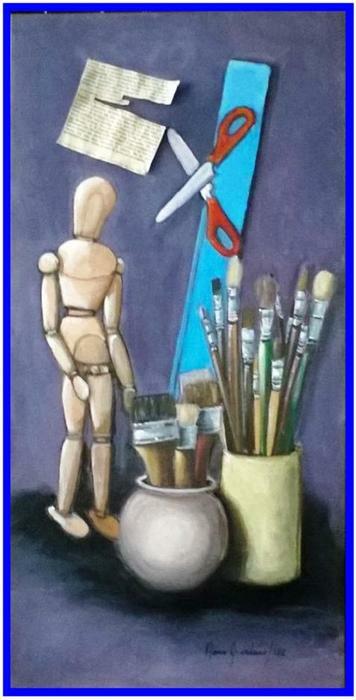 In "JOB" you see some of the objects that I use to paint, there are brushes, a line, scissors, paper collages, an articulated mannequin; here there is also an explicit reference to the painting as a job, not only as an inspiration. In "HAPPY HOUR" you see some of the objects of the recreation after the working day, there are a clock that marks the 18 h, cups and straws. The 3 paintings represent three different moments that make my day: culture and preparation, inspiration and execution, entertainment. The interconnection is also given by the choice of similar background colors. 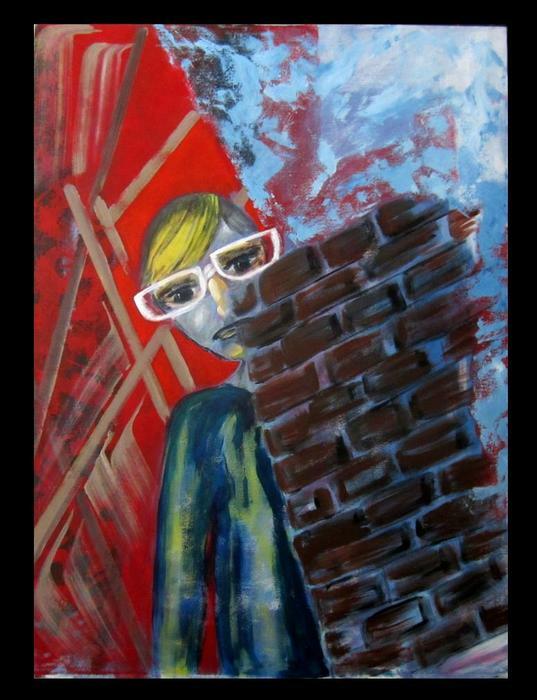 We were most impressed by your superb oeuvre such as "EDUCATION JOB" which resonates with a profound visual narrative as you reveal the invisible within the visible. The spiritual artistic journey that you portray in your stellar oeuvre was quite impressive and was a triumph of personal expression. The painters who spend the night to paint, drinking a cup of coffee after another and smoking hand-rolled cigarettes, are just a legend. You need discipline, exactly as for boxing trainings. There are timetables to be respected, exercises to be repeated: keep the rhythm, be tenacious and do everything rigorously. These are the three Cerberi that will protect you from the worst enemy of the painters. The deadline. Do you know what it means? It means that your brain, which is fanciful by nature, is forced to produce according to schedules established by others. It's practically like if you were a lad and your boss ordered you to arrive very precisely at a given place at a given time: you have to make it, no matter if there is traffic or if you got a tire puncture. You can not be late, otherwise you're screwed. And the same thing has to happen with the deadlines that will be imposed by your manager. Your manager is both your husband and your boss: without him you are nothing, but you can’t stop from hating him. But if you can afford this luxury, play with him. It's much more fun. 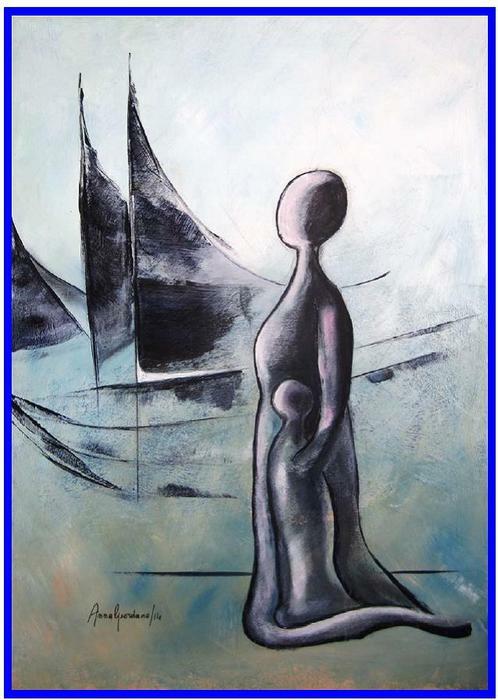 And so “WAITING” and “HOPE”, that both represent a mother looking at the sea with her child. But the mother who waits, is looking at the sea together with the baby for welcoming the father on his return (would he be a fisherman, a sportsman, a trader? anyway he is surely the one who provides for the maintenance of the family); therefore she shows anxiety for the fondness of her husband, and for daily needs too. 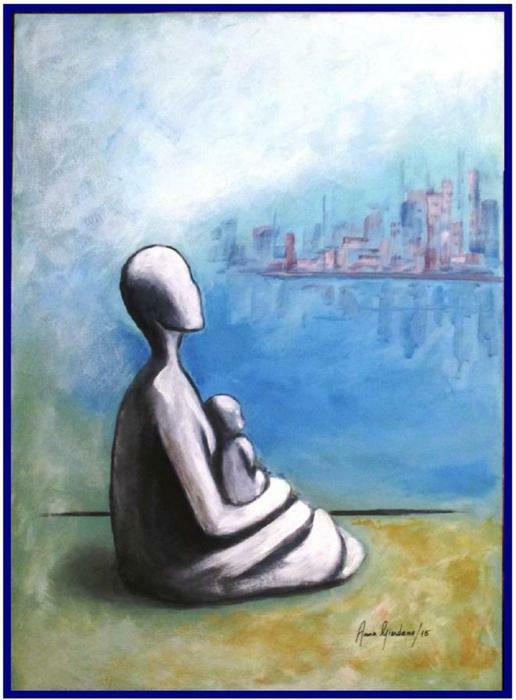 And on the contrary, the mother who is looking across the sea in the distance, toward the big city, hopes to move there and to get a better future for her and perhaps for her child: would she be a single mother, an islander cut off from the real world of the mainland? Surely, to put facing the two paintings, as made the Editor of the magazine “Art & Beyond”, makes it much more recognizable these questions, and others that may come to mind. Era de Maggio is the title of a famous Neapolitan song; the small piece of paper attached to the canvas is a copy of the original music paper of the song. So they are “VAMP” and “MODERN WOMAN”, where the vacuity of the vamp, who is intent only to dress up in bright colors, and for the rest is empty and closed in herself admiring, is opposed to the complexity of the true modern woman who does not give up the bright colors but is engaged on many fronts, as house, music, sports, food and wine, gardening. The real modern woman is not just engaged, but even more good looking than the vamp. "MODERN WOMAN" is my artwork so far most reviewed and a particular was used to illustrate my profile in the art book “Excellences”. exhibited at solo exhib “Pennelli”, Galleria Anacapri, April 2016, Isle of Capri. 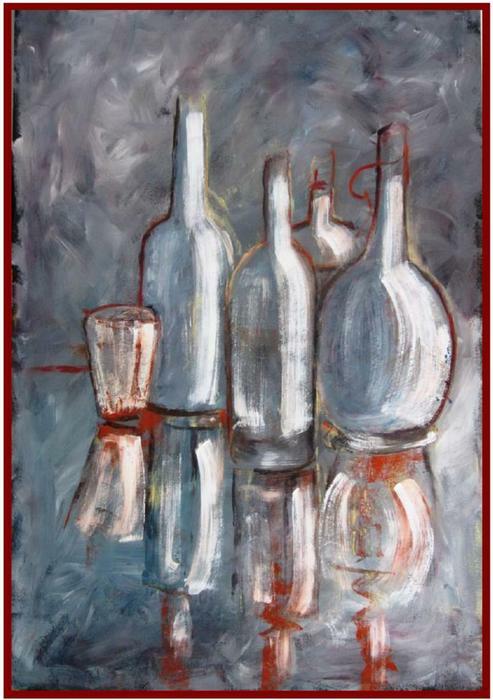 We were enthralled by the emotive quality ''6 BOTTLES" which reflects your fine talent and vibrant visual intensity of colors, as well as your lyrical use of Light. Always looking for a balance between the flow of inspiration and the contemplation of the content, it is now no more enough for me to simply produce artworks in which, through a visible recognizable, also it is possible to describe the intangible, invisible, behind people and things, but I need that my works, poetical from my point of view, " narrate "something. And maybe they, put side by side, would narrate something extra because of the approach, leaving even room to the imagination of the viewer. 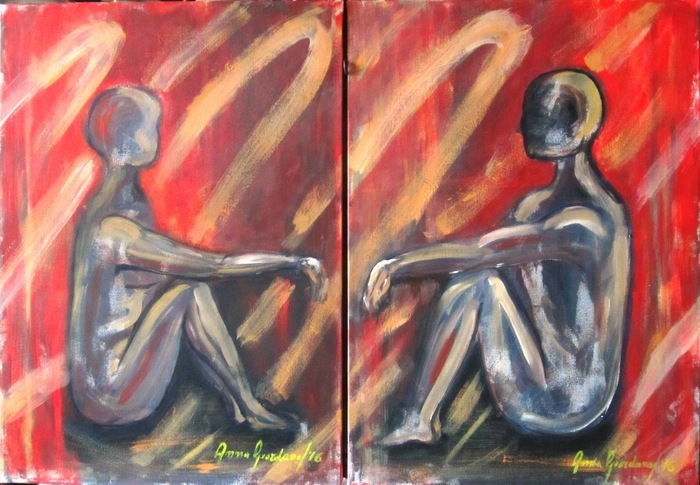 And to put side by side the two paintings “Ma Folle”, a figure of a woman, and “Mon Fou”, a figure of a man, leads to absolutely different thoughts, as a consequence of how they are positioned. 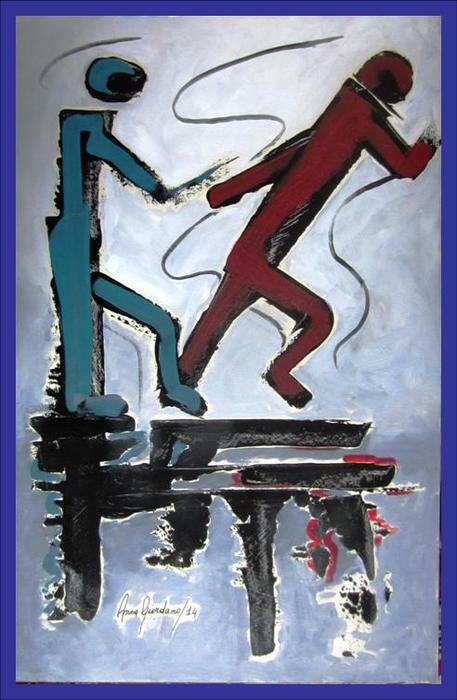 In “Love”, Ma Folle is on the left and Mon Fou on the right; the two figures are facing each other, and you can imagine a strong bond that unites them. 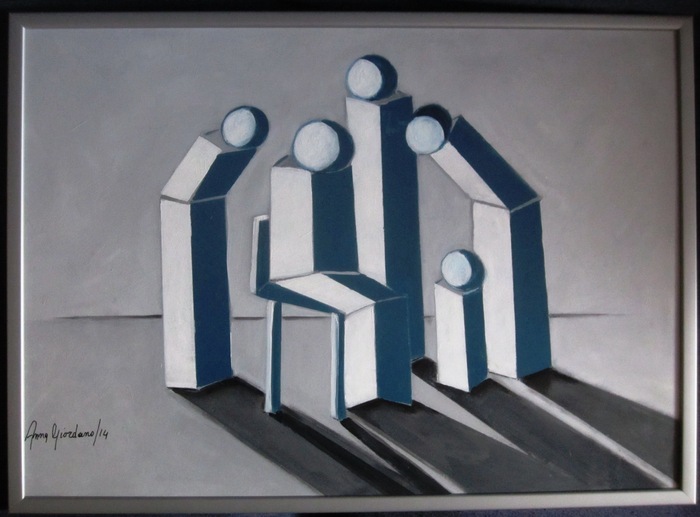 And, vice versa, in “Indifference”, it is Mon Fou on the left; the figures seem to ignore each other and you can imagine at least the absence of special links. Same inspiration and subject, different interpretation. But in both cases arises my sense of decency, that takes me to suggest, but not underline, the feelings. their holidays on the beach. La pittura è la mia passione, ormai da tanti anni. Painting is my passion, now for many years. La peinture est ma passion, depuis de nombreuses années. La mia pittura naturalmente evolve, e partendo dal figurativo sono arrivata ad un astratto, in cui oggetti e persone sono comunque riconoscibili. My painting naturally evolves, and, starting from figurative, I arrived at an abstract, where things and people are anyway recognizable. Ma peinture évolue naturellement, et en partant du figuratif je suis arrivé à un abstrait, dans lequel les objets et les gens sont quand même reconnaissables. Mi piace spaziare tra più stili, ad esempio ho dipinto anche molti quadri completamente astratti, con un cromatismo accentuato, che possono essere definiti “belli”, ed alcuni hanno effettivamente ricevuto critiche molto incoraggianti e sono stati selezionati per importanti mostre; si tratta di quadri che i detrattori definiscono “decorativi”, ma sono comunque una tappa dell’impegno di pittore professionista. 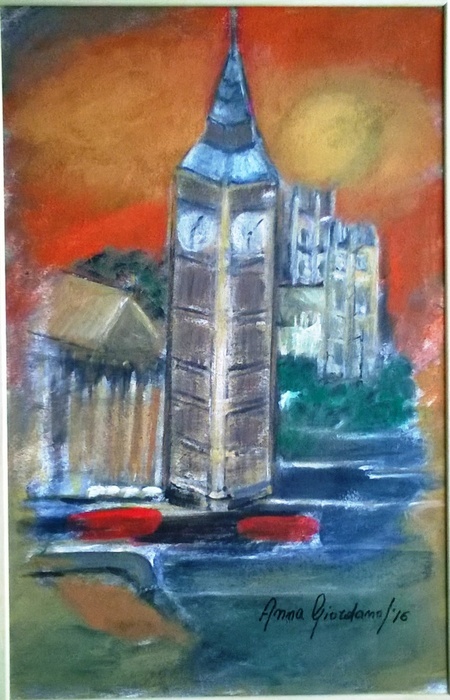 I like to sweep around many styles, for example I painted also many completely abstract paintings, with accentuated chromatics, which can be defined as "beautiful", and some in fact have received very encouraging comments and have been selected for major exhibitions; these are paintings that critics call "decorative", but they are still a stage of my commitment as a professional painter. J’aime espacer dans plusieurs styles, par exemple j’ai peint aussi beaucoup de tableaux complètement abstraits, avec chromatismes accentués, qui peuvent être définis comme «beau», et certains ont en effet reçu très encourageants remarques et ont été sélectionnés pour des expositions importantes; ce sont les peintures que les critiques appellent «décoratives», mais toutefois elles restent une étape de mon engagement en tant que peintre professionnel. •	published in the n. 2/2015 of the magazine Effetto Arte and in the n.10/2015 of the magazine Biancoscuro. Una grande capacità esecutiva nella trasfigurazione dell’astratto, con ottima versatilità e stupore rivolto alla ricerca di un progetto emotivo. L’Artista crea la sua intuitiva proiezione caratteriale e simbolica, sovrapponendo segni e simboli dalla ricca stesura materica. Une grande capacité exécutive dans la transfiguration de l’abstrait, avec très bonne versatilité et étonnement adressé à la recherche d’un projet émotif. 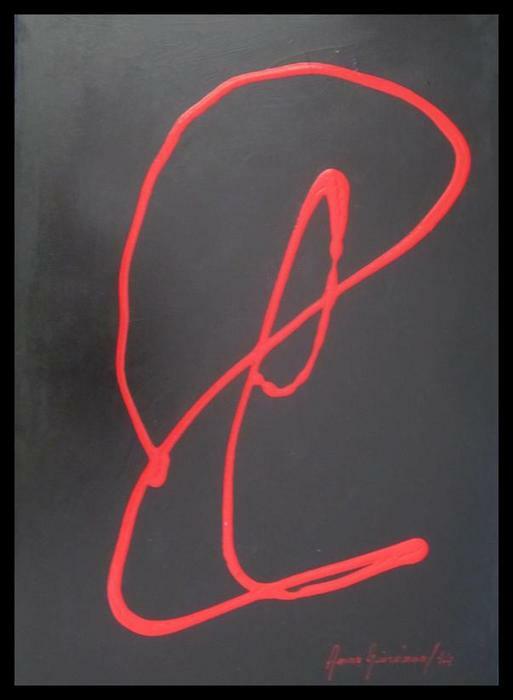 L’Artiste crée son intuitive projection caractérielle et symbolique, en superposant signes et symboles de riche rédaction matérique. 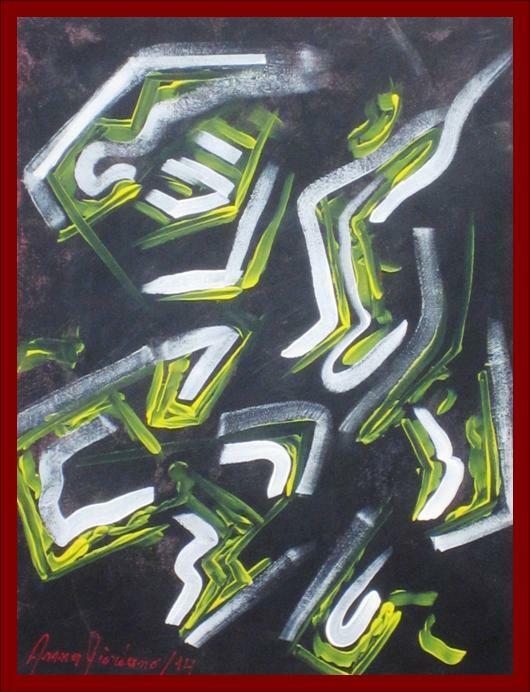 in the on line gallery Art & Beyond, 2016 http://www.